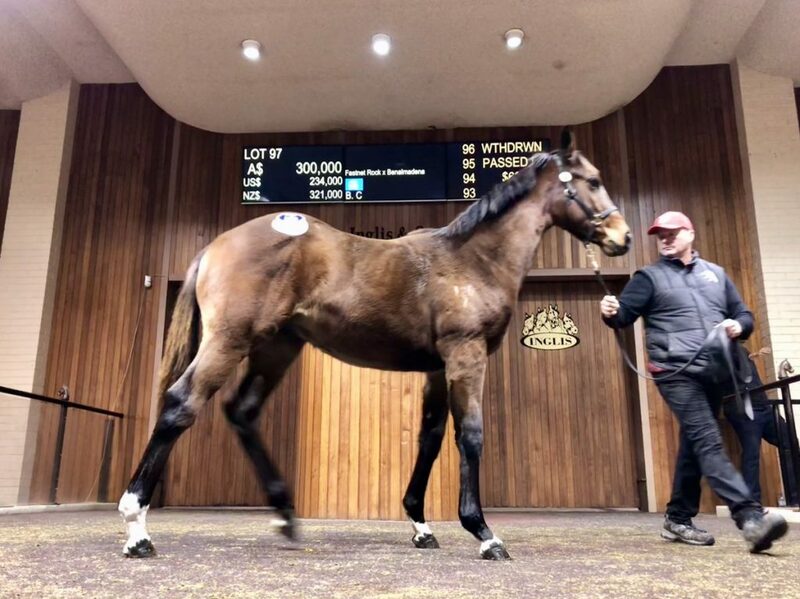 Rosemont Stud, Woodside Park and Written Tycoon were among the leaders of the Inglis Great Southern Sale select weanling session over the past three days. And Victorian farms sold each of the ten highest priced weanlings with no less than eight farms represented in that group. Rosemont, Woodside Park, Glenelg Park, Willaroon, Two Bays Farm, Ponderosa, Erinvale and Hillside all featured. The sale, however, was dominated by progeny of commercial stallions with buyers less keen on sires seen to be outside of that sphere. Off the back of a significantly increased catalogue, the select weanling session aggregate was up by $252,000, however average prices decreased by 18.2% to $24,532 while the median decreased from 15,000 to 12,000. Rosemont Stud’s Lot 97 Fastnet Rock x Benalmadena (FR) colt was the sale topper going for $300,000 to the bid of Kia Ora Stud and Bhima Thoroughbreds. Woodside Park’s Champion Victorian stallion Written Tycoon topped the sire’s list (3 or more sold), with his 10 lots selling at an average price of $93,150. Glenelg Park’s Danny Swain sold a colt ($175,000 and filly ($155,000) by Written Tycoon and was naturally thrilled with those results. “Written Tycoon is the best stallion in Victoria and to be Victorian breeders selling at a Victorian sale and having results like this is very rewarding,” Swain said. “The two horses were in high demand in their inspections and that certainly carried through to the sale ring. Sheamus Mills bought the lot 244 Written Tycoon colt from Glenelg Park on behalf of Palya Bloodstock and Saconi Thoroughbreds. Meanwhile Woodside Park Stud was awarded leading vendor for the select sale selling all 18 of its offerings for an aggregate of $948,500. Woodside’s General Manager Commercial James Price said the sales results for the farm were very pleasing and equally satisfying was the performance of the stud’s headline sire Written Tycoon. “It’s great to be the leading commercial stud in Victoria,” Price Said. 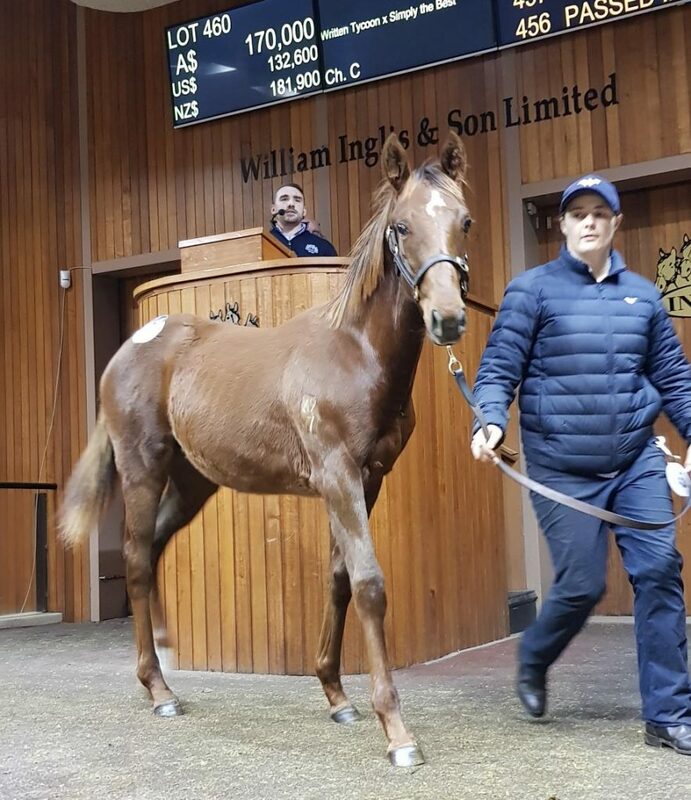 Inglis’ Victorian Bloodstock Manager Simon Viivan said he was pleased with the outcome of the weanling session, but an increased catalogue this year resulted in a lower average. “There was good trade right through and I was really pleased. As we’ve endured in a couple of sales this year, clearance rates were tricky initially but with natural adjustment of buyers and sellers we ended up with a clearance rate in excess of 80 per cent,” Vivian said. “(The average) was drop off, but we also knew that we put a lot of horses into the sale who were probably going to struggle to make a select yearling sale next year.